The Paderewski Memoirs. Ignacy Jan Paderewski. Da Capo Press. 1981. ISBN 0306760460 (hardcover). Paganini. John Sugden. Omnibus. 1992. ISBN 071190264X (paperback). This series of biographies presents the great composers against the background of their times. Each draws on personal letters and recollections, engravings, paintings and, when they exist, photographs, to present a complete picture of the composer's life. 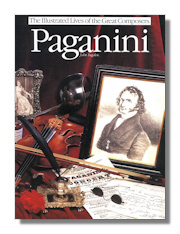 Previously published as Niccolo Paganini: Supreme Violinist or Devil's Fiddler. 168 pages. Niccolò Paganini. François J. Fetis. AMS Press. 1988. ISBN 0404129099 (hardcover). Reprint of Fetis' Biographical Notice of Paganini. Niccolò Paganini. Jacques G. Prod'Homme. AMS Press. 1975. ISBN 0404130968 (hardcover). Niccolò Paganini - His Life And Work. Stephen Samuel Stratton. Reprint Services. 1907. ISBN 078129102X (hardcover). Paganini Of Genoa. Lillian Day. Reprint Services. 1929. ISBN 0781207541 (hardcover). Paganini Of Genoa. Lillian Day. Reprint Services. 1929. ISBN 0781207541 (hardcover), 0781291011 (paperback). Palestrina. Alberto Cametti. AMS Press. 1925. ISBN 0404128785 (hardcover). Palestrina. Henry Coates. Reprint Services. 1948. ISBN 0781296137 (hardcover). Palestrina. Henry Coates. Hyperion Press. 1948. ISBN 0883557320 (hardcover). Palestrina's Style; A Practical Introduction.. Malcolm. Boyd. Oxford University Press. 1973. ISBN 019315224X (paperback). 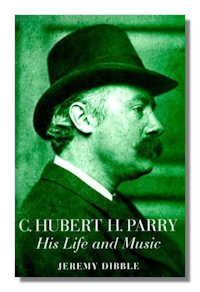 C. Hubert H. Parry: His Life and Music. Jeremy Dibble. Oxford University Press. 1992. ISBN 0193153300 (hardcover). Sir Hubert Parry was one of Britain's most creative and influential musicians, and a key architect of the English Musical Renaissance. This is a major reappraisal of Parry, both of his life and his vast legacy of compositions. Well known for three enduringly popular works – Blest Pair of Sirens, I was Glad, and Jerusalem, almost an unofficial national anthem – Parry has long been presented as a paternal, establishment figure. Yet Parry's personality was infinitely more complex, as Jeremy Dibble makes clear. Drawing on a wealth of documentary evidence made available for the first time, he is able to draw a detailed portrait of a radical, energetic, yet hypersensitive and lonely man. Dibble also charts Parry's development as a composer, and presents a detailed examination of his works illustrated with a number of musical examples. 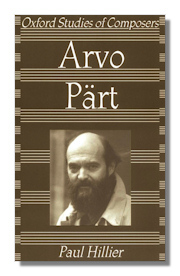 Arvo Pärt (Oxford Studies of Composers), Paul Hillier. Oxford University Press. 1997. ISBN 0198166168 (paperback). The music of the Estonian-born composer Arvo Part is a unique and powerful voice in the contemporary world. Using a tonal idiom based on a mixture of scales and triads, Part created a style that he calls "tintinnabuli". Listening to it, one is reminded of the passionate tranquility of some Russian icon, or of certain memorable scenes in the films of Andrei Tarkovsky. In this book Paul Hillier explores Part's "tintinnabuli" works in some considerable depth. He also examines the music of Part's earlier, somewhat neglected serial period, and charts the composer's steady evolution towards the "abstract tonality" of his later years. A biographical chapter and discussion of topics such as Russian Orthodox spirituality, minimalism and the influence of early music are also included. Hillier also draws on his own experience of working with the composer to offer thoughts on various performance issues. 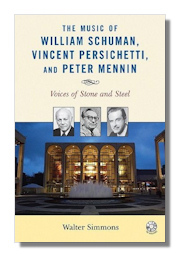 The Music of William Schuman, Vincent Persichetti, and Peter Mennin: Voices of Stone and Steel. Walter Simmons. Amadeus Press. 1995. ISBN 0810857480 (paperback). William Schuman, Vincent Persichetti, and Peter Mennin were three of the most significant American composers of the 20th century, yet their music has largely disappeared from view since their respective deaths. Because they each spent the majority of their careers working at the Juilliard School and Lincoln Center, their music is often viewed as "interchangeable". Walter Simmons provides a thorough examination of the lives and work of these artists, clarifying their considerable individuality both as composers and as human beings. The book begins with a comprehensive introduction summarizing the conventional view of the history of American music, while noting the marginalization of traditionalist composers, those who preferred to work with the musical forms and developmental principles on which the body of Western classical music is based. In the chapters that follow, each composer is presented through a brief overview and a biographical essay, followed by a general description of his style. Extensively researched and including detailed discussions and insights, the sections include lists of the composer's "most representative, fully realized works" and then provide systematic overviews of most or all of their compositions, giving the reader a general understanding of the artist and his work. The overviews contain a description of each composition, information concerning first performance and first recording, excerpts from reviews as well as Simmons' own critical assessment of each, and a statement of its place within the composer's output as a whole. A selected bibliography and essential discography follows at the end of each chapter. With a photo of each composer and a representative sampling of their music on the enclosed CD, readers will find this book a valuable resource. Read the Classical Net Review of this book. The Music of Hans Pfitzner (Oxford Monographs on Music), John Williamson. Oxford University Press. 1992. ISBN 0198161603 (hardcover). Francis Poulenc. Wilfrid Mellers. Oxford University Press. 1995. ISBN 019816338X (paperback). Once considered as little more than the froth in the wake of the First World War, a witty boy-hedonist who, in the giddy Twenties, tweaked the noses of moribund establishmentarians, Poulenc has in fact proved unexpectedly durable – more so than any of his colleagues among Les Six, Here is a survey of Poulenc's music, based on careful selection of his works, and written by an authoritative guide. 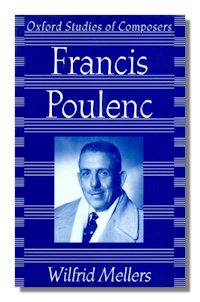 Adopting a broadly chronological approach, Mellers traces Poulenc's development as a composer from enfant terrible to a mature composer both for secular society and for the liturgy of the Catholic Church; in so doing he points to the reasons for the durability and pertinacity of his appeal. Mellers further assesses Poulenc's place in the French tradition, and, in a Postlude, pays tribute to the warm regard with which Poulenc was held by so many of his fellow musicians. Read the Classical Net Review of this book. Francis Poulenc - Music, Art and Literature. Sidney Buckland, with Myriam Chimenes (Editors). Ashgate Publishing. 1999. ISBN 1859284078 (hardcover). Francis Poulenc. Benjamin Ivry. Phaidon Press. 1996. ISBN 071483503X (paperback). This book is rich in photographs and integrates the composer's life and work in a relatively brief, candid, very accessible form. No musical examples. 240 pages. Sergei Prokofiev. Daniel Jaffe. Phaidon Press. 1998. ISBN 0714835137 (paperback). Serge Prokofieff - A Soviet Tragedy. Victor Seroff. Taplinger Publishing Co. 1969. ISBN 0800870670 (paperback). Intertwining of political and musical anecdotes in an engaging biography. Prokofiev. Claude Samuel, with Miriam John (translator). Marion Boyars. 2000. ISBN 0714504904 (paperback). Giacomo Puccini. Conrad Wilson. Phaidon Press. 1997. ISBN 071483291X (paperback). The Purcell Companion. Michael Burden (Editor). Amadeus Press. 1995. ISBN 0931340934 (hardcover), 0931340926 (paperback). Henry Purcell. Robert King. Thames & Hudson. 1995. ISBN 0500016259 (hardcover).